The 29th Annual Springfield Sports Hall of Fame Induction Ceremony will be held on April 8th, 2019 at the Crowne Plaza Hotel. Tickets, priced at $50 ($25 for Hall of Fame members), can be reserved by calling Lesa Schaive at 529-0008. Tom Thayer spent eight seasons playing for the Chicago Bears and the past 22 seasons serving as a color analyst on the team's radio broadcasts. The 57-year-old Thayer was the starting right guard on what many experts believe was the best team in NFL history, the 1985 Bears. That team -- which included NFL Hall of Famers Walter Payton, Dan Hampton, Richard Dent and Mike Singletary and was coached by Hall of Famer Mike Ditka -- went 15-1 in the regular season and then beat the New York Giants 21-0, the Los Angeles Rams 24-0 and the New England Patriots 46-10 in the Super Bowl. That was the only Super Bowl title in franchise history. Thayer grew up in Joliet and was a member of two state championship teams at Joliet Catholic Academy, where he played for the legendary coach Gordie Gillespie. Gillespie, who was inducted into the Joliet Catholic Academy Hall of Champions along with Thayer in 2014, has referred to Thayer as "one of the five best players I ever coached, and he was the best lineman." After graduation from JCA in 1979, Thayer received a scholarship to play at Notre Dame under first coach Dan Devine and then Gerry Faust. He was an honorable mention All-American and received a degree in media communications in 1983. 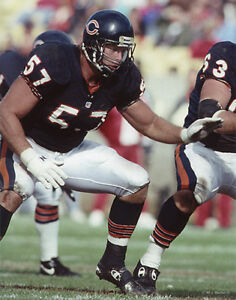 Thayer signed a three-year contract with the fledgling Chicago Blitz of the United States Football League in April of 1983 on the day the Bears made him their fourth-round selection in the NFL draft. 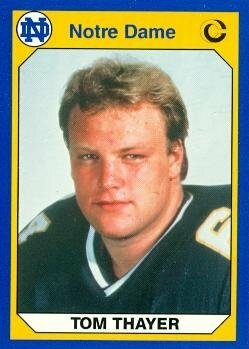 He spent three seasons in the USFL with the Blitz and the Arizona Wranglers before signing with the Bears in 1985. He started 130 of the 134 games he played for the Bears in eight seasons. He was waived after the start of the 1993 season and appeared in three games for the Miami Dolphins before retiring in 1993.